Anne Luna – Although that thing’s bigger than she is, Anne Luna makes playing the bass look easy. Having the good fortune of being raised in a musical family, Anne has been toting her bass to jams, festivals, and gigs for over half her life. While attending South Plains College where she received her AA in Commercial Music (2004), Anne was voted Female Instrumentalist of the Year for two consecutive years. 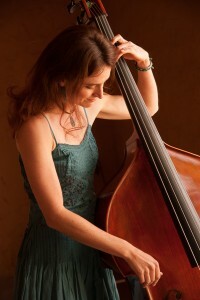 To complement her instruction at SPC, Anne studied classical bass techniques at Texas Tech University (where she earned a degree in biology!). She has recorded with Alan Munde, Kenny Maines and Amanda Shires and performed with the Spring Creek Bluegrass Band, Doctor Skoob and the Acoustic Groove, the April Verch Band, Steve Smith and Hard Road, and Hot Foot Toby. She currently performs with The Hard Road Trio. She has taught at Hill Country Acoustic Music Camp, Camp Bluegrass, Desert Night Acoustic Music Camp, and several workshops across the country. She also teaches private lessons. She has performed at Tucson’s Desert Bluegrass Festival, Mammoth Bluegrass Festival, High Mountain Hay Fever, Santa Fe Old Time and Bluegrass Festival, Black Hills Bluegrass Festival, Bluegrass on the Green, The Rice Festival, Berkeley’s Freight and Salvage, and Poor David’s Pub in Dallas. Her playing has been described as graceful, elegant and at the same time, hard-driving. As a writer and vocalist, she brings a unique voice to round out the Trio. As an instructor, her energy and easy-going manner create a welcoming atmosphere for students.